For vertical shaft machine applications that cannot be satisfied using the Michell AV, LV or V product ranges, we will develop a solution that is specific to the project using our extensive library of products as a basis. This can include combined thrust and guide bearings or guide only bearings. The scope of supply will be tailored to the specific customer requirements. Design and scope of supply developed to suit the individual project. Available with single (downward) thrust pads and upper thrust capability via tilting upper thrust pads or a whitemetal location face. Can include offset pivoted tilting thrust pads in order to reduce oil film temperatures and maximise film thicknesses. Centre pivoted thrust pads can be fitted when continuous bi-directional operation is a requirement. High pressure oil injection can be incorporated in the thrust faces if required. Radial loads are supported on line pivoted whitemetal faced tilting pads. PTFE thrust pads can be incorporated in the lower thrust face to increase the downward thrust capacity and reduce the bearing frame size. Available with water cooling, circulating oil cooling or fan / air cooling. 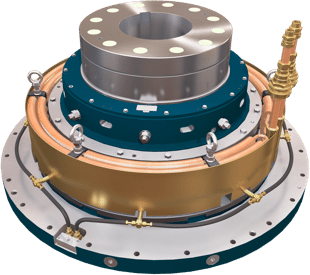 Integral cooler assemblies can be supplied in cupro-nickel, stainless steel or titanium. Electrical insulation can be provided. Sealing to various IP grades can be provided at the top or bottom of the bearing as required. Design can accommodate a wide variety of instrumentation requirements.